If you are looking for a hearty weekend lunch or a weeknight dinner that can be varied according to individual tastes, a sandwich is a pretty good place to start. 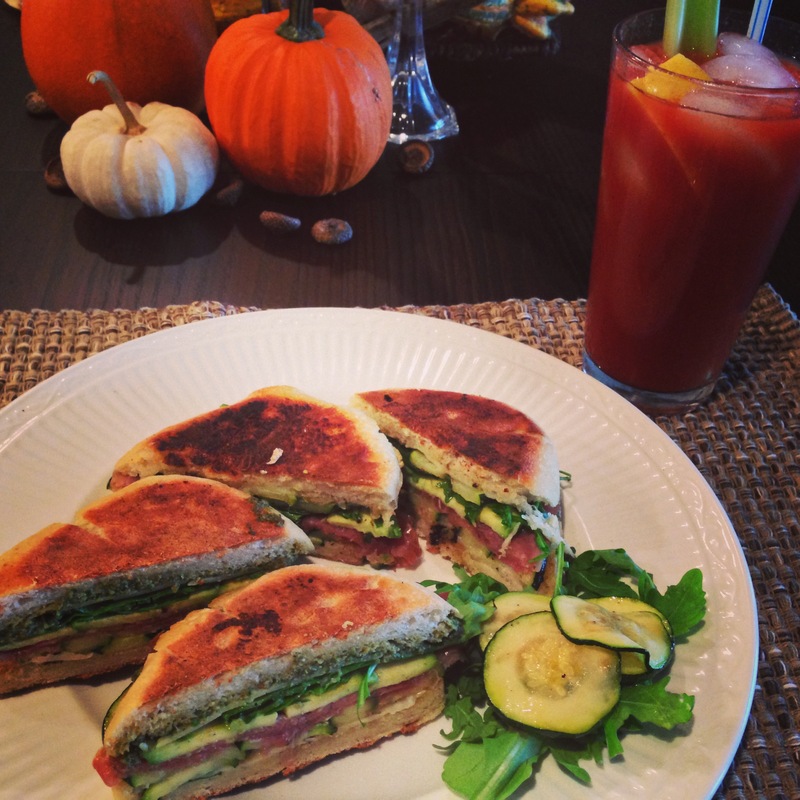 Making a Panini is an easy way to spice up the meal, especially in cold weather with a side of soup. 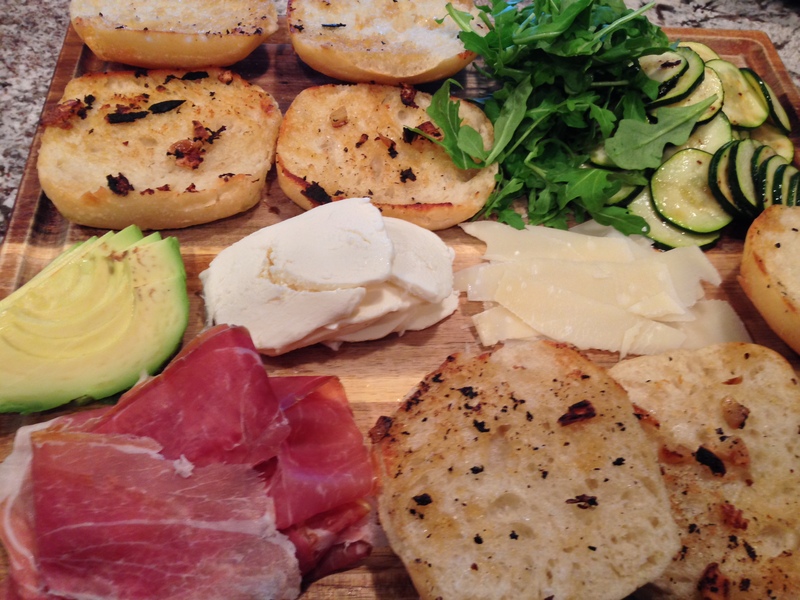 To make the Panini today I started with small loaves of half-baked ciabatta bread from Trader Joe’s. A hearty bread such as ciabatta or sourdough holds up nicely to the heat you will be adding to cook the panini and allows for a lot of ingredients stuffed inside. A little trick to add flavor and a little more crunch is to toast the inside of the sandwich first. Today I really went wild toasting the bread in a cast iron skillet that had a thin layer of bacon grease and roasted garlic…delicious. Like I said you can really make any combination you want, I will share what I used today as it was amazing! This is enough for 4 small sandwiches. 4 small loaves of ciabatta bread, fully baked. 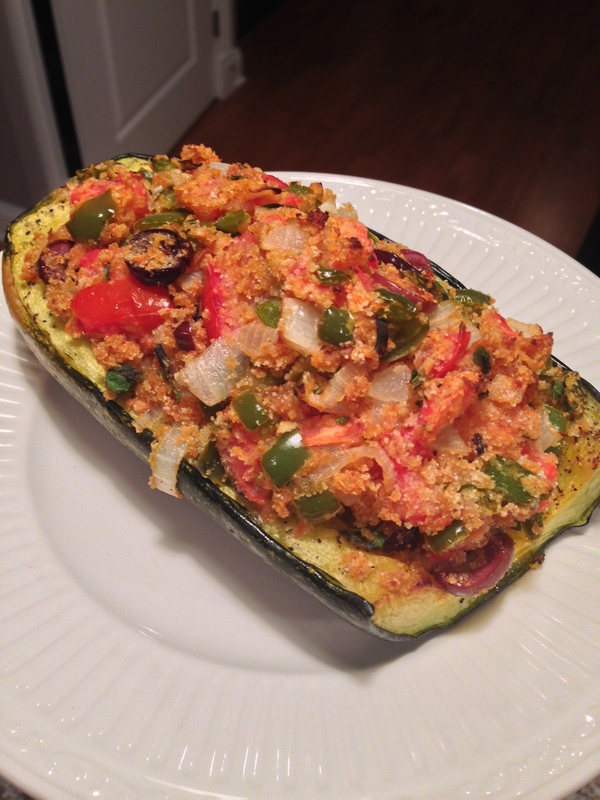 1 small zucchini thinly sliced, sauteed until cooked adente. 1. Prepare your bread first: Cut loaves in half. Heat heavy skillet over medium heat to warm bacon grease (or oil of choice). Add thinly sliced roasted garlic to hot bacon grease, stirring for about 1 minute. Place sliced bread in skillet cut side down to brown in bacon grease, when you remove bread try to keep the garlic slices on the bread for extra flavor. 2. 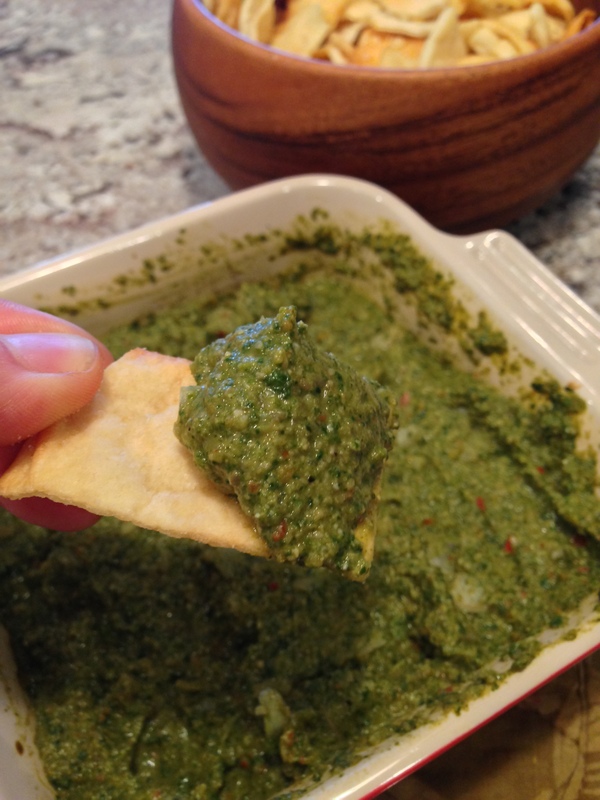 Prepare your sandwich by smearing spinach and artichoke dip inside top half of bread. 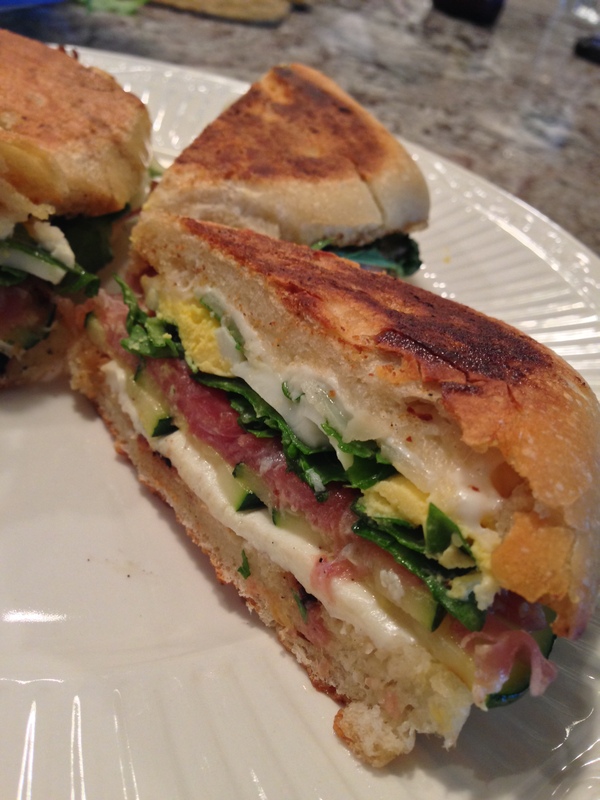 Place a slice of mozzarella cheese on bottom side of bread, layer with zucchini, followed by prosciutto, avocado, a few pieces of arugula, fresh shaved parmesan (to make this a breakfast sandwich we added thinly sliced hardboiled eggs to a few as well). 3. 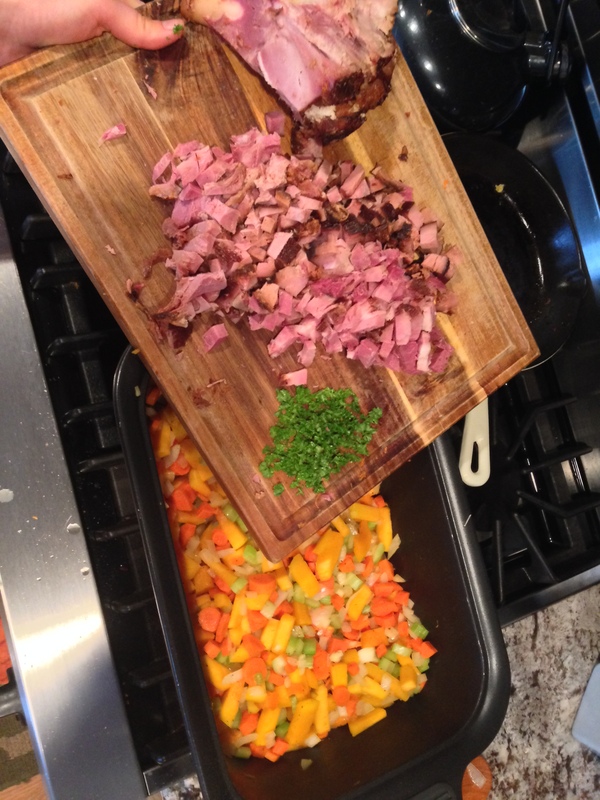 In your heavy skillet on medium-low heat place the sandwich in the pan. If you have a panini press, use it to smoosh the sandwich gently. Flip over after a few minutes when bottom is browned and cheese is starting to melt. -Place cheese in sandwich twice, once on the bottom and once on the top of your pile-up, this will keep the panini together better once cooked. You don’t have to use the same kind of cheese, I used mozzarella on the bottom and parmesan on the top. -Slice all ingredients very thin so they can be layered smoothly to prevent them from slipping out when you take a bite or press the panini. -Cook on lower heat for longer periods of time to allow center to get hot and cheese to melt. -If you are using sliced bread (like a grilled cheese), butter the outside with a mixture of butter and mayonnaise (50/50 mix) to avoid burning while cooking. -A classic combination that never fails: tomatoes, mozzarella, fresh basil, and a smear of pesto. 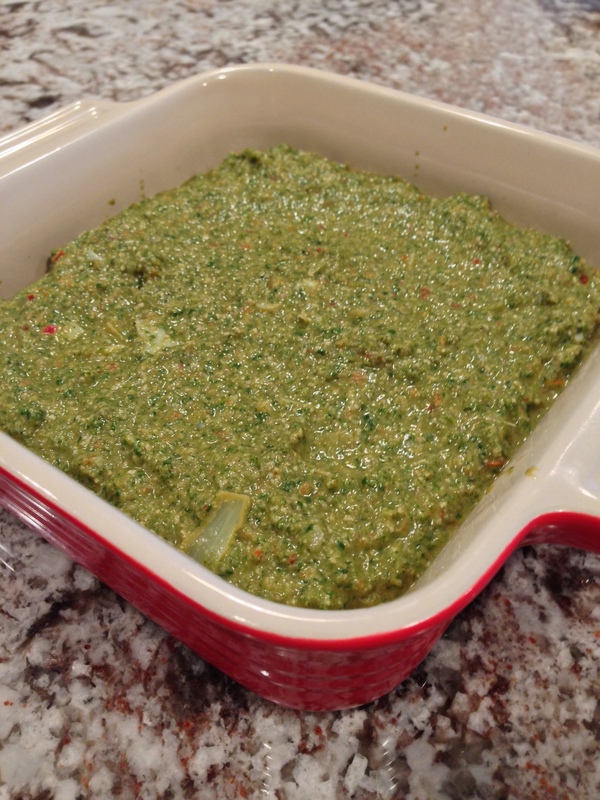 Last weekend I made a vegan spinach and artichoke dip from http://www.plantpoweredkitchen.com (great ideas on this site). 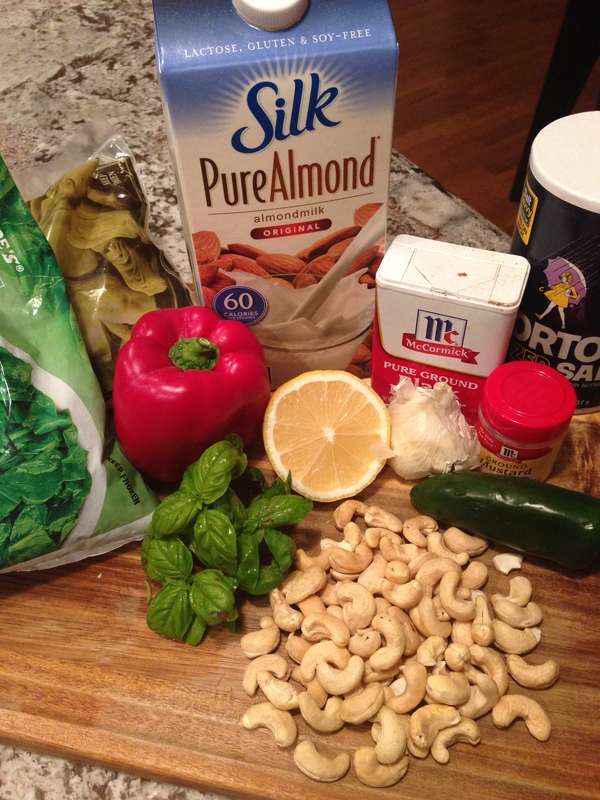 I really enjoyed the idea of pureeing cashews with almond milk to make a dairy-free creamy base for a dip or spread. I took the recipe a step or two in a different direction to make a vegetable based dip (no longer vegan) with peppers, basil, and a little parmesan. After a few trials I found a combination that is really good and very healthy. Earlier this week I baked it with chicken over a bed of onions, not bad. 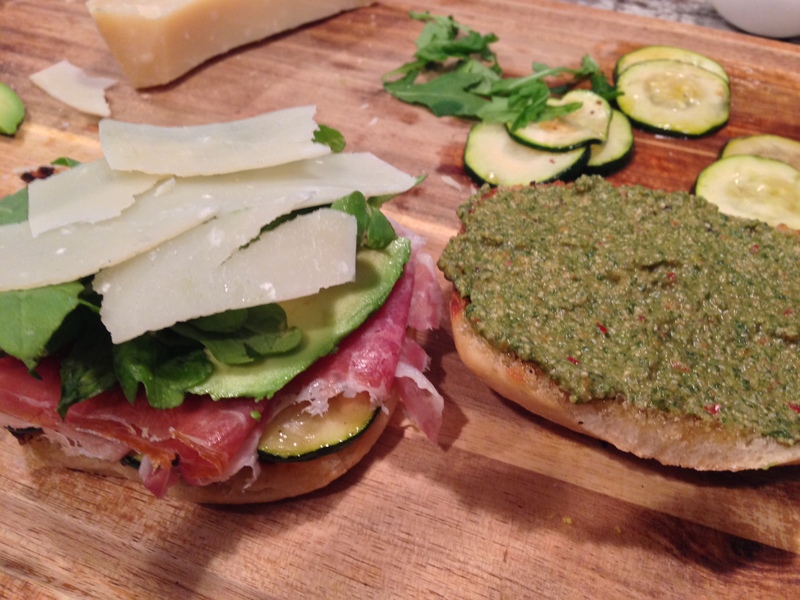 The real winner came today when I used the dip as a spread on a prosciutto panini (recipe to come), it was perfect. The spread alone is a simple snack to bring to a gathering or to put out on football Sunday. 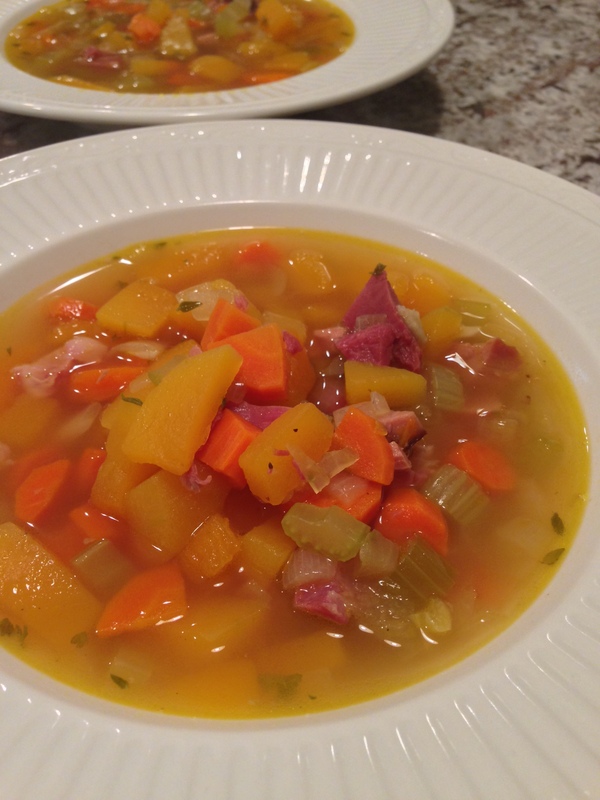 Serve warm with veggies, pita chips or toasted bread. If you are into the dairy-free thing, skip the cheese. 1. Add cashews, almond milk, lemon juice, garlic, basil, salt, mustard, red pepper flakes, and jalapeno to food processor with “s” blade. Process for 1-2 minutes until liquid. 2. 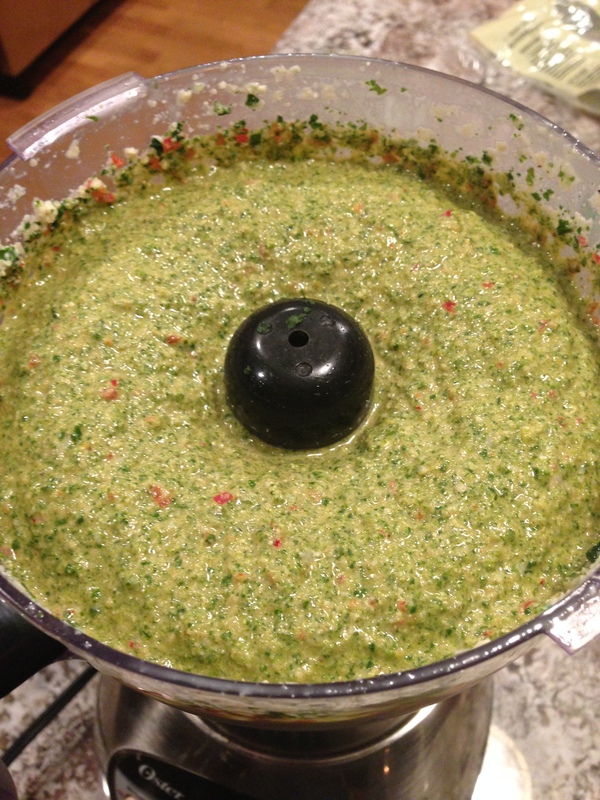 Add red pepper, spinach, and artichokes to food processor and blend until combined to desired consistency. Add more almond milk as needed. If you are planning to serve this as a warm dip, just pulse in the vegetables to leave larger pieces of artichoke and pepper. If using as a spread then pulse to the consistency above. Stir in the parmesan cheese. 3. Spread the mixture into a small baking dish to heat for serving at 400 for 20-25 minutes. 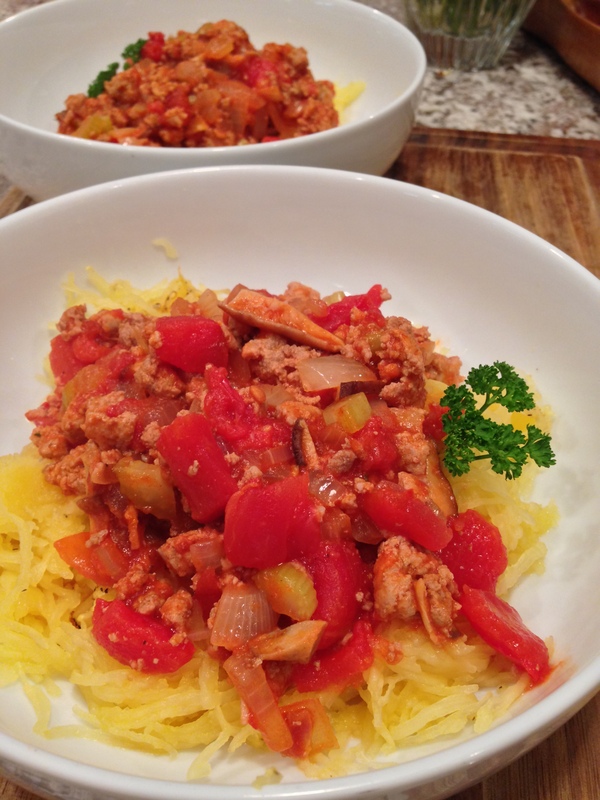 My mission of reducing processed foods in our diet is reaching an all time high with spaghetti squash season. 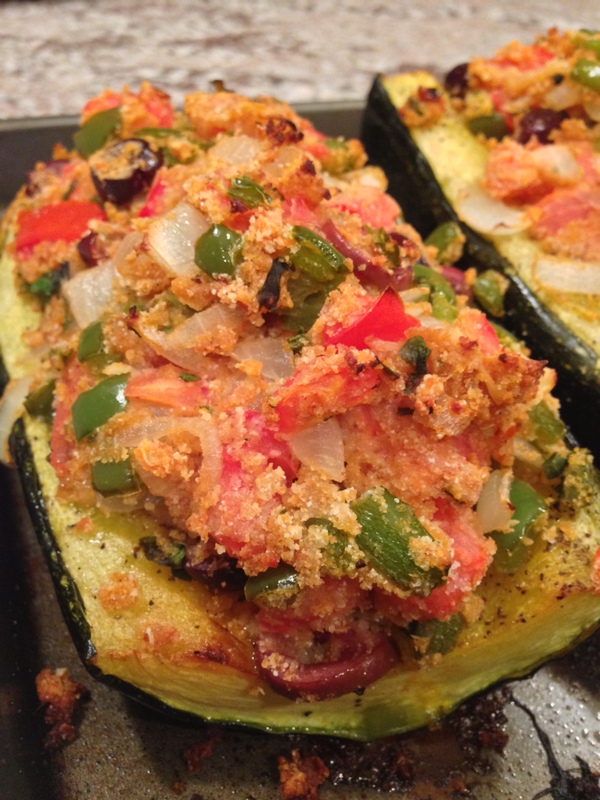 This dish is easy, flavorful, and very healthy. 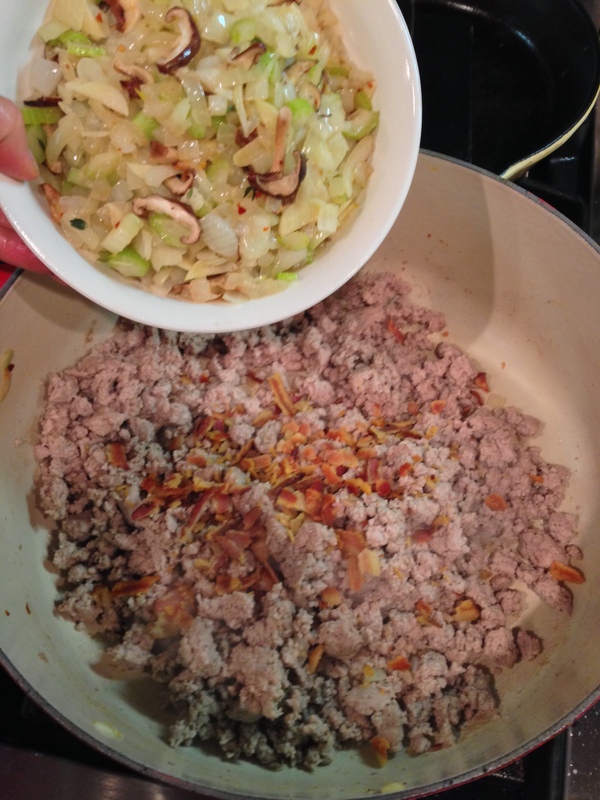 From what I have learned a bolognese is really just a meat based sauce, so you can substitute for any meat of choice if you don’t have ground turkey on hand. This recipe started to develop for me after I read a recipe from Martha Stewart (we are totally friends 😉 ), then I added a few additions of my own…like more bacon…and wine…and mushrooms. My husband really enjoyed this dish without me having to make regular pasta noodles, so I consider this a total success! 1. 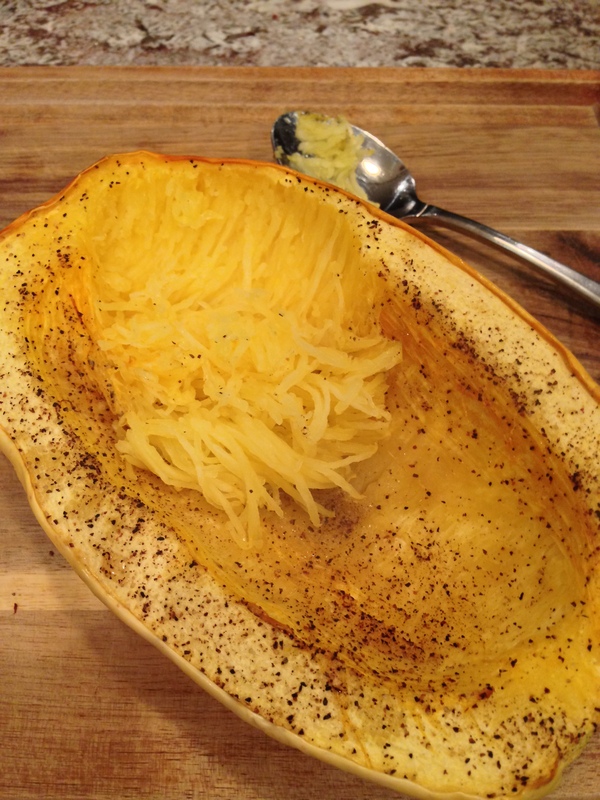 Cut spaghetti squash in half, remove seeds, spray with olive oil and season with pepper. Bake in oven at 375 for 45 minutes. When it is fully cooked it is easily scraped out with a spoon to make spaghetti-like strands. 2. 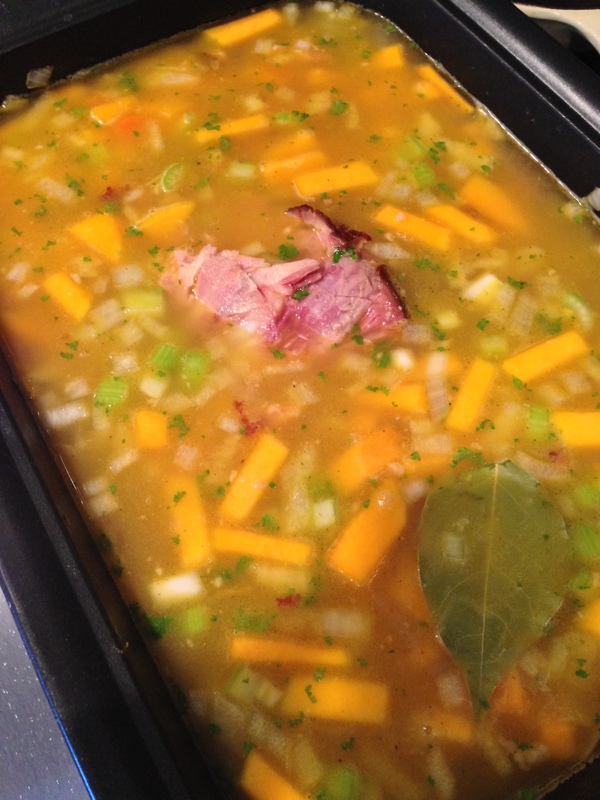 While squash is cooking, in a large heavy sauce pan cook bacon over medium heat until cooked through, remove from pot to use later. 3. Add 1 Tbsp of infused olive oil to pan with bacon grease along with onions, celery, mushrooms, garlic, thyme, red pepper flakes and black pepper, cook for 10-15 minutes until soft. 4. Remove onion and mushroom mixture and put in bowl for later use. 5. Brown turkey in pot, breaking to crumble. When fully cooked drain grease and add onion and mushroom mixture and crumbled bacon back to pot. Add red wine and simmer for 5 minutes before stirring in tomatoes and tomato sauce. 6. Let simmer for 30 minutes to develop flavor. 7. 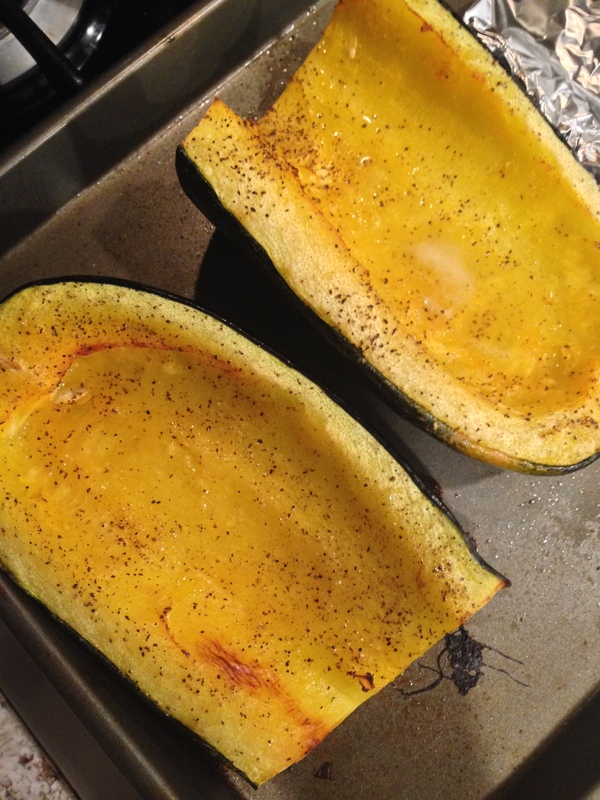 Serve over spaghetti squash, add parmesan cheese if desired. 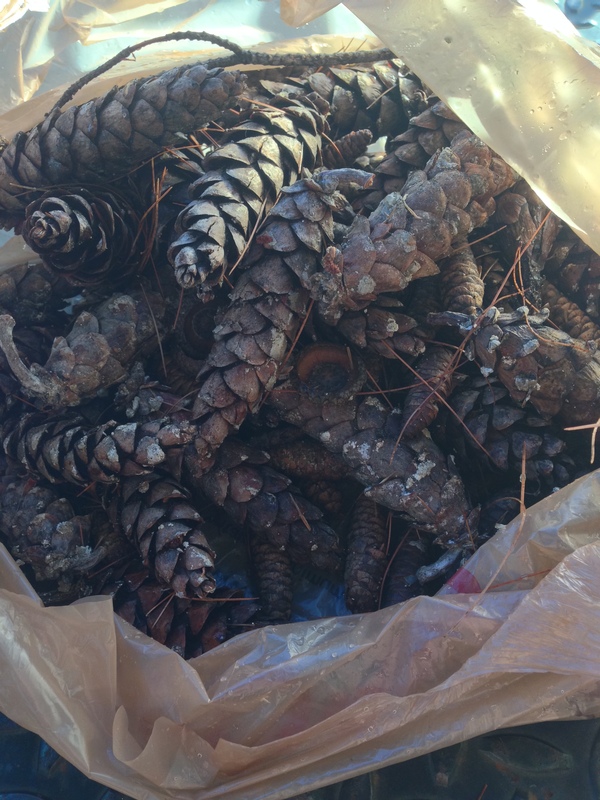 On a recent trip up to Wisconsin I collected a large number of pine cones from the woods around the cottage. Before bringing them inside the house a very important step to take is de-bugging the cones! Pine cones are a nice home for little bugs that can then run wild in your home. 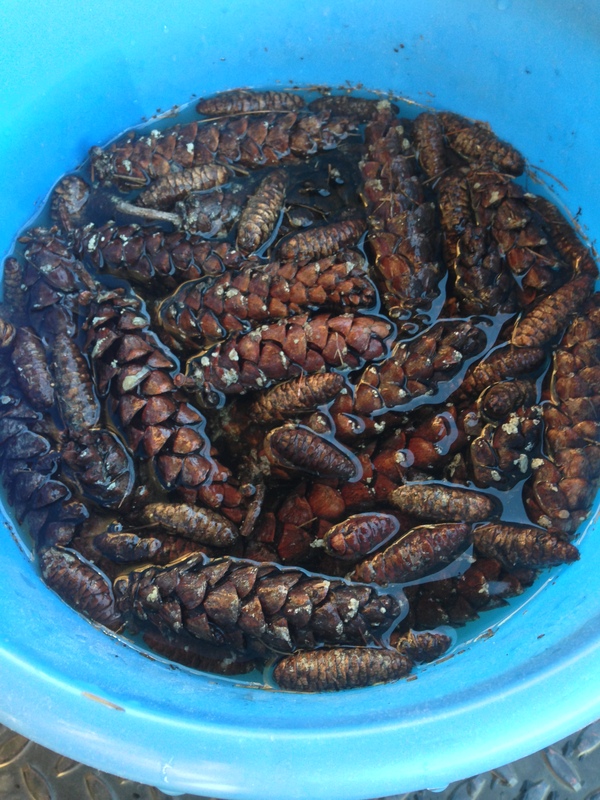 De-bugging your pine cones is easy and there are several ways to go about it. I used a soaking method instead of baking them in the oven, I just imagined the gas oven catching the pine cones on fire and burning down the entire condo building…you’re welcome neighbors. 1. Start by putting 1 cup of household ammonia into the large bucket and filling 1/2 way with at least 2 gallons of warm water. 2. Pull out needles and dirt as able before putting all the pine cones into the ammonia water, fill up as needed with warm water to cover the cones. 3. The cones will float, so make sure to mix up occasionally or use a heavy bucket on top to submerge cones as able. 4. Allow the cones to soak for about an hour, then rinse well with water. 5. Next you want to lay the cones out in the large plastic bin lined with newspaper. 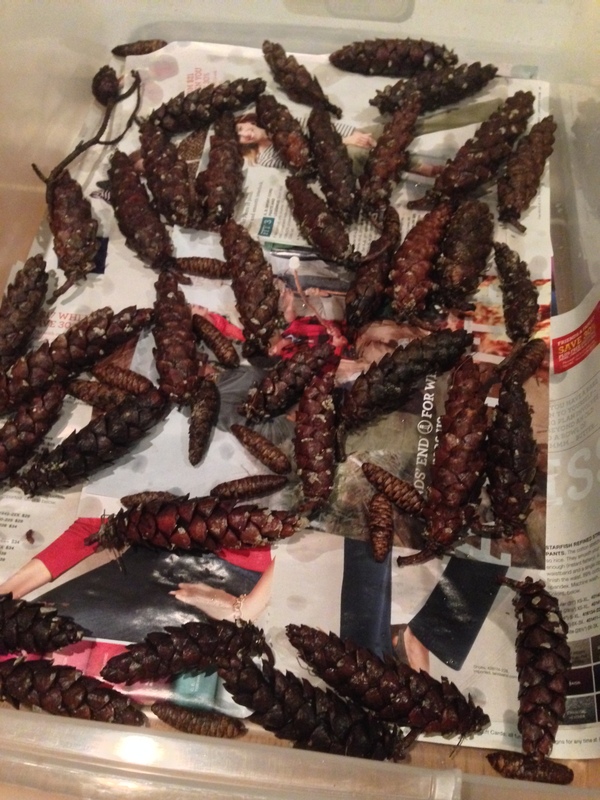 I brought the cones inside at this point to dry, otherwise I was afraid they would get new bugs in them while drying outside. The cool thing about pine cones is that they close up when they are wet then open back up when they are dry. So when you are picking pine cones don’t be afraid to grab the ones that aren’t open, they will open up once they are clean and dry. 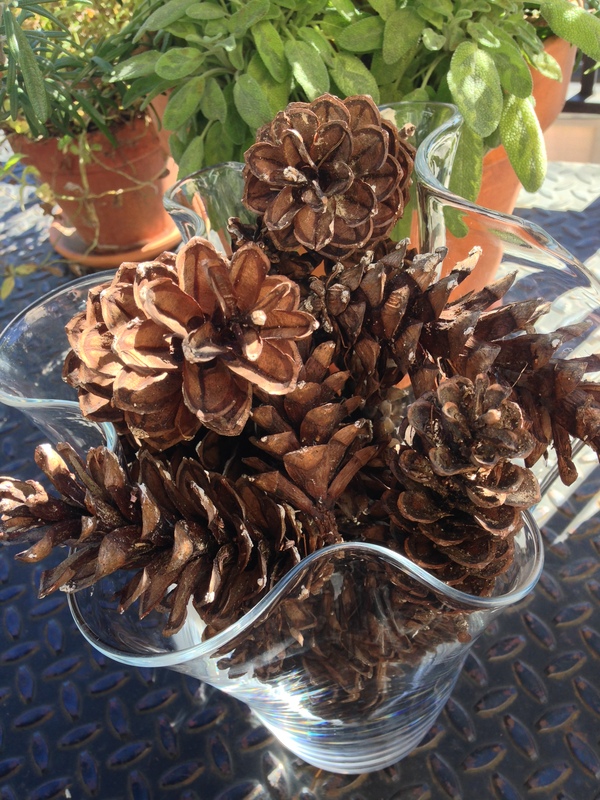 I found a bunch of really little pine cones that I’m excited to use in a small centerpiece or two this winter. -White Cones- you can soak in bleach water instead of ammonia water, you need to let them soak longer (like 8-10 hours) before rinsing. – Shiney Cones- after de-bugging spraying with a clear polyurethane spray and let dry as recommended on spray can. – Glitter Cones- after de-bugging you can decorate the cones with glue and glitter, a fun craft project for little kiddos! After getting rave reviews of the apple pie, I decided to make another baked good just in time for the weekend. Traditionally I stay away from making baked goods, because I just eat them…very quickly. I find if I don’t make a cake, I won’t eat a cake. However, my in-laws are coming to town this weekend and I decided it would be good excuse to make something sweet to share while they are here. 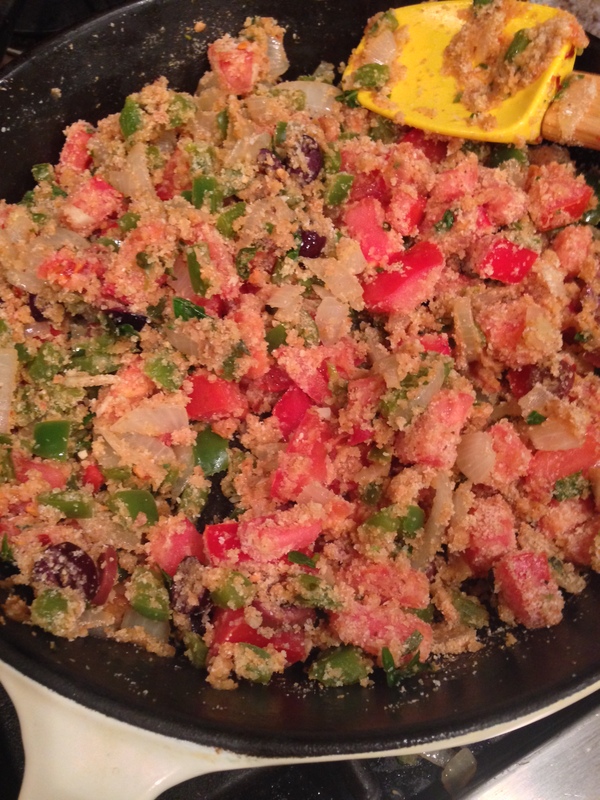 This is a recipe I found online on a blog (www.damndelicious.net) that is really healthy, delicious, and relatively easy. Instead of making 3 small mini loaves, I made one regular size loaf and 6 muffins with a batch. 1. Preheat oven to 350 degrees. Coat bread pans with a thin layer of butter, then lightly flour so the bread doesn’t stick when removing from pan. Do the same to muffin tin unless you are using cupcake papers. 2. Make crumb topping: Combine ingredients in a medium sized bowl and set aside. 3. Make cake mix. Combine the dry ingredients together in a large bowl: flours, sugar, brown sugar, pumpkin pie spice, baking soda, baking powder, and salt in a large bowl. 4. In a small bowl whisk together the wet ingredients: pumpkin puree, coconut oil, butter, applesauce, eggs, and vanilla. 5. Stir together the wet and dry cake ingredients gently, take care to not over mix. 6. Fill the cake pan and muffin tins just over halfway full with cake mix. Sprinkle generously with the crumble topping, pushing gently into the batter. 7. Bake the muffins in the oven for 30 minutes and the cake loaves for 45-60 minutes. the center will be spongy and a toothpick inserted should come out clean. The apple sauce and coconut oil make you feel like you are eating a healthy snack and allow the cake to stay extremely moist. All the moisture of the cake is counterbalanced by the crumbles on top. 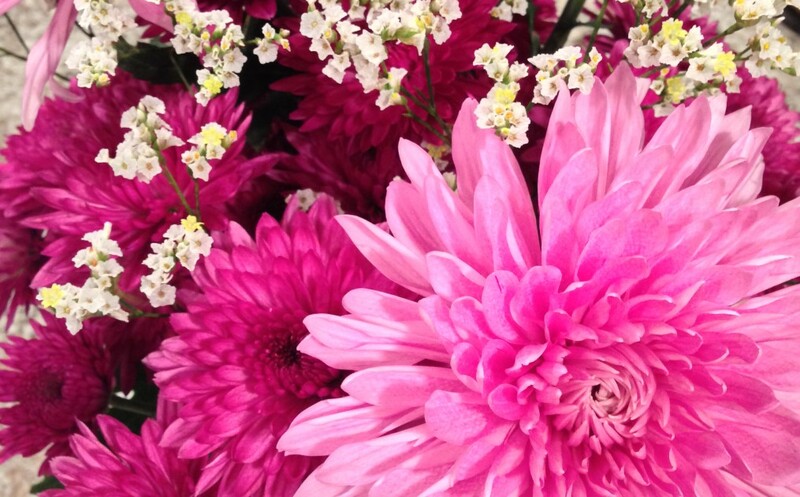 These can get messy, try serving with a fork and plate so you don’t lose the yummy crumbles. This can also be a good dessert served warm with vanilla ice cream.